Frampton's father was a maker of stained glass and his paintings usually religious in theme have some of the same qualities. He was influenced by Burne-Jones. 68.5 by 122 cm., 27 by 48 in. In taking the present subject, E.R. Frampton had in mind the account given of the legend given by Mrs Jameson, who in Sacred and Legendary Art describes how the Queen Catherine of Alexandria, who was to be martyred for her faith, dreamt of being escorted by an old hermit to a sanctuary on a mountain top: 'When they reached the portal, there came out to meet them a glorious company of angels clothed in white, and wearing chaplets of white lilies on their heads'. 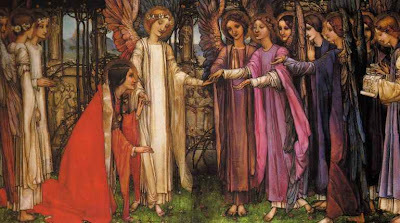 'Then they led her to an inner court, where stood a second company of angels clothed in purple, and wearing chaplets of red roses on their heads; and Catherine fell down before them, but they said, ''Stand up, our dear sister Catherine, for thee hath the King of Glory delighted to honour.'' Then Catherine, with a trembling joy, stood up and followed them.' (Sacred and Legendary Art, two volumes, new edition, 1891, II, p.471) The present painting, shown at the Royal Institute of Painters in Oil Colours in 1903, was in some way intended as a companion to an earlier subject, shown two years previously, in which Frampton represented the translation of the body of St Catherine after her death to the summit of Mt Sinai. Frampton's early training as an artist was as an assistant to his father, who was a maker of stained-glass for churches. This formative experience seems to have led Frampton to consider how Christian themes might be treated in a way which would inspire faith. He was immensely struck by the two large exhibitions of the work of Edward Burne-Jones at the New Gallery, in 1892-3 and the memorial exhibition in 1898-9, and he may therefore be regarded as one of the followers of Burne-Jones who maintained the tradition of treating elevated and uplifting figurative subjects into the twentieth century. On the occasion of Frampton's own memorial exhibition, in 1924, P.G. Konody wrote of him as 'a belated Pre-Raphaelite, a follower of Burne-Jones. He lived in a world of romance and legend.' Frampton was a deeply religious man who sought to reinvent the iconography of Christian art by taking unfamiliar subjects and by treating them in a way which, although highly crafted and meticulous, is entirely original in aesthetic terms and intense in religious feeling.